Gulmarg & Sonamarg - Travel to Gulmarg & Sonamarg in Himalayas which is full of amazing sights, blessed with all the natural bounties, surrounded by towering peaks, trekking and hiking trails, a popular honeymoon destination and known for its immense natural beauty all over the world. Gulamrg and Sonamarg are not just two hill resort destinations of Kashmir, they also make the ultimate adventure zone of the Kashmir valley. 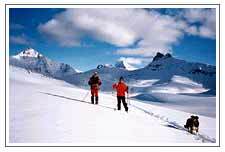 Gulmarg makes an excellent base for trekking in the northern Pir Panjal Range. Nanga Parbat can be seen to the north from several view points, including Khilanmarg, west and over 1,500 feet up the forested hillside from Gulmarg. From a distance, the Pir Panjal appears somewhat rounded, but when you are actually walking up its slopes, you will find that its smoother peaks rise above evergreen clad slopes that seem quite equal in steepness to those of the main Himalayas. Situated at an altitude of 2,650 m, Gulamarg has got the highest green golf course in the world. The layout of the course is quiet striking and the layout is similar to a normalgolf course with land slopes and inclines along the complete area of the course, which has a par of 72. The golf club was started by the British who used Gulmarg as a holiday resort, and opened it for golf lovers in the year 1904. At present the Jammu & Kashmir Tourism Development Corporation manages the club. Gulamarg is also counted among the best skiing resorts in India, but you require a pretty good experince as well as training to ski down the slopes over here.Gulmarg also make a good ski spot for starters, those who are new to skiing. Ski enthusiasts can easily find out all required gear and equipments as well as professional ski instructors in Gulmarg, to try out a hand on skiing. The longest ski run in Gulmarg is provide by the Gondola Cable Car, where skiers can swoosh down the slopes from the height of 2, 213m. Sonamarg is the starting point of a major trek passing several mountain lakes - Vishansar, Kishansar, Gadsar, Satsar and Gangabal. One trek leads all the way to the Amarnath Cave. The other reason for Sonamarg's importance lies in the fact that it is the last halt on the Kashmir side for the drive from Sri Nagar to Leh. One of the most popular short walks from Sonamarg and a major attraction during the summer months is the 4-km route to Thajiwas, a small valley at the foot of the Sonamarg glacier. A path leads up to the Shakhdar hill, overlooking the glacier from the northeast. 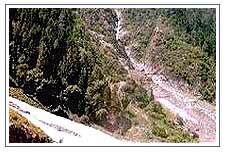 It is dangerous to climb the steep slope leading up to the glacier. 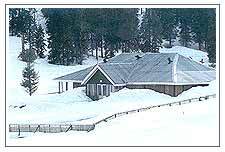 Gulmarg is in Baramula District and is 56-kms from Srinagar and Sonamar is 81-km from Srinagar. The nearest Airport is situated in Badgam District, which is well connected with all the major cities of India. The nearest railhead is atJammu. All sorts of transport are available to Gulmarg from Srinagar bus stand at Batmallo and from private transport operators. Bus services to Sonamarg are available from Srinagar and Anantnag.